As the in-house roof consultant in charge of more than 12 million square feet of roofing for a large property owner, I've had the advantage of managing the same roofs for many years. My associate and I have walked each of 400 roofs yearly to review their condition, specify repairs, reroof when necessary and inspect the completed work. Naturally, I've become familiar with what works and what doesn't work, where leaks come from, and most importantly, why they are many times never fixed. Thanks to a sophisticated property management department that tracks leak calls from more than 1,600 tenants, we have kept records on where roofers found leaks and what repairs where made. 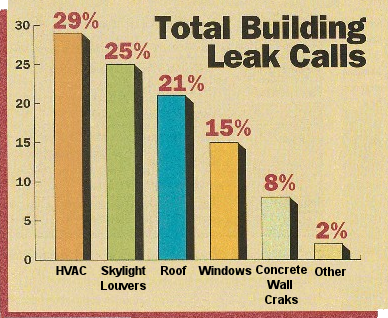 Most building owners would be surprised about what they are sending roofers out to fix (see chart below). Amazingly, only 21% of these leaks came from the roof. Unfortunately the roof is a working platform and drop spot for every construction trade (mechanical, electrical, plumbing, etc. ), and many times the equipment itself is not waterproof. 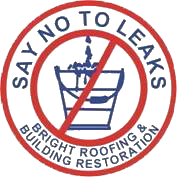 This often leads to roof leaks; maybe not immediately, but sometimes years later, when the warranty has run out. Tenants incorrectly assume that all wet ceiling tiles mean roof leaks, but in reality, it is often rooftop equipment that is no longer waterproof, not the roof membrane. So a roofer is called to look at the roof, while mechanical, electrical and plumbing contractors remain blissfully unaware of the equipment problems. This dilemma is compounded on poorly maintained roofs where there are always roof problems to fix and nothing else is considered. Even on maintained roofs, roofers still look for roof problems and make repairs to anything in the vicinity, thinking the "roof leak" is solved. Meanwhile, air-conditioning units or skylights continue to take in water. Roofers have typically concentrated on roofing only, not mechanical, electrical or plumbing. Consequently, they are untrained in these areas. Many times they are told directly by their management not to inspect or repair rooftop equipment for fear of liability, or simple lack of know-how. When calling in the non-roofing trades to fix the equipment problems, finger pointing is often the result. The building manager owner is then left in an impossible situation. However, we are seeing a few knowledgeable, full-service roof contracting companies that are offering maintenance programs that take rooftop equipment problems into consideration. Their crews may not be able to fix all the leaks, but they are adept at discovering and then documenting them for the other trades. is a Registered Roof Consultant and holds a CDT certificate from the Construction Specifications Institute. He provides roof surveys, reroof specifications, management and consulting for the roof consulting department of a large property owner. Mandzik was a senior consultant with a national roof consulting firm for more than nine years and a roofing contractor prior to consulting. He was also senior roofing manager for a nationwide property management company for more than 12 years and has 31 years of construction experience on a variety of roofing systems. Mandzik is a member of the Roof Consultants Institute (RCI) and the International Conference of Building Officials (ICBO).